The goal: To let them help treat as many of the more than 2.5 million people addicted to painkillers or heroin in the nation as they can. Tens of thousands more nurse practitioners and physician assistants could be helping, too, by applying for a federal license to prescribe the potentially life-saving medicine. But laws in more than half the states are likely to prevent nurses from using their licenses in rural areas that need it most. 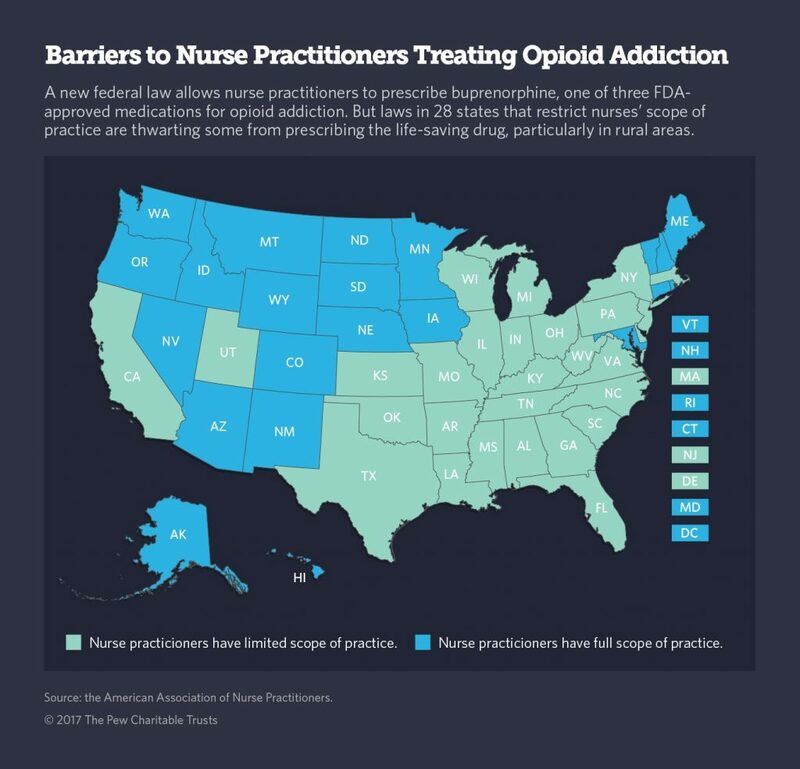 Twenty-eight states prohibit nurse practitioners from prescribing buprenorphine unless they are working in collaboration with a doctor who also has a federal license to prescribe it. The problem is, half of all counties in the U.S. do not have a single physician with a license to prescribe buprenorphine. In addition, laws in Oklahoma, Tennessee and Wyoming explicitly prohibit nurse practitioners from prescribing buprenorphine — one of three anti-addiction medications approved by the U.S. Food and Drug Administration — with or without a doctor’s supervision. And a law in Kentucky prohibits physician assistants from prescribing the safe and effective drug. “We’re losing people every day, and governors are asking how long it will take before this additional group of clinicians is able to get out there and start providing medication-assisted treatment,” said Maureen Cahill, senior policy adviser at the National Council of State Boards of Nursing. But some of those governors should blame their own “scope of practice” laws. Those laws restrict what nurse practitioners and physician assistants can do, including providing buprenorphine to people with opioid addictions to help them kick their habit. Treating opioid addiction with buprenorphine can be highly effective. It prevents withdrawal symptoms and curbs cravings. But a federal license is required to prescribe it for addiction treatment. Only one in 10 people in the U.S. with an addiction receive treatment. In large part, that’s because of a shortage of trained treatment providers, especially ones who can prescribe buprenorphine. To help address that, Congress last year enacted the Comprehensive Addiction Treatment and Recovery Act. One of the law’s most significant provisions allows nurse practitioners and physician assistants to apply for a federal license to prescribe the medicine. Until now, only doctors could prescribe buprenorphine, and in the 15 years since the drug was approved, fewer than 39,000 doctors have sought a license to do so. Meanwhile, there are more than 222,000 nurse practitioners and about 109,000 physician assistants in the nation, and many of them offer primary health care in rural parts of the nation where the opioid crisis is most acute. The two federal agencies that issue licenses — the Substance Abuse and Mental Health Services Administration (SAMHSA) and the Drug Enforcement Administration — have so far approved them for 560 nurse practitioners and 184 physician assistants. Mitra Ahadpour, who oversees buprenorphine licensing at SAMHSA, said she expects applications to increase as more health care professionals learn about the new law and take a free, three-day online training course. Applications for licenses to prescribe buprenorphine may not surge, however, unless states change their scope of practice laws to allow nurse practitioners and physician assistants to use their prescribing power on their own. Some have. West Virginia, which ranks No. 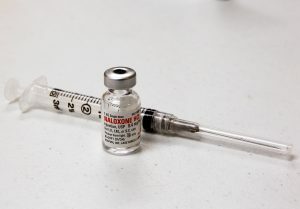 1 in the nation in overdose deaths, last year changed its scope of practice law to allow nurse practitioners to diagnose, prescribe and treat patients without a doctor’s supervision, with the exception of prescribing schedule II drugs such as Percocet, Vicodin and OxyContin. South Dakota granted nurse practitioners full practice authority in February. Oregon is updating its rules to authorize nurse practitioners to prescribe buprenorphine for addiction. Nurse practitioners in Oregon already have authority to prescribe schedule III drugs, including buprenorphine, for pain management. But previous state rules, which reflected federal law at the time, prohibited prescribing it for addiction. Changing the laws isn’t easy, though, despite the training that nurse practitioners and physician assistants have. In addition to an undergraduate nursing degree, nurse practitioners must complete a graduate program to be certified. Physician assistants, who work directly with doctors, must complete at least two years of advanced studies after obtaining a bachelor’s degree. A 2010 Institute of Medicine report cited nearly 50 years of academic studies and patient surveys in concluding that primary care provided by nurse practitioners has been as safe and effective as care provided by doctors. But state medical societies, which represent doctors and wield significant influence in most legislatures, are reluctant to cede professional turf to nurses. Arguing that nurse practitioners lack the necessary level of medical training, they insist that it is unsafe for patients to be treated by nurse practitioners without a doctor’s supervision. Some doctors also have a financial incentive to limit nurses’ independence. Often carrying heavy medical school loan debt, they can be loath to see their revenue diverted by competing health care services, particularly those with lower fees. The Federal Trade Commission has weighed in on legislative efforts to give nurse practitioners more autonomy in several states, arguing that physician groups have no valid reason for blocking such laws other than to thwart their competition. Still, getting state lawmakers to update their scope of practice laws has been a slow process, said Taynin Kopanos, vice president of state government affairs for the American Association of Nurse Practitioners. “Although nurses care very much about getting more treatment to people who need it, and governors and lawmakers do as well, scope of practice laws are not likely to be changed overnight just because of the opioid epidemic,” Kopanos said. This story was produced by Stateline, an initiative of The Pew Charitable Trusts. You can view the original report on its website.